Postman Prat by Lew Stringer // Copyright © DC Thomson & Co. Ltd.
For all its faults, twitter is a splendid way of expressing one’s frustrations in a timely manner. Another thing it’s good at is getting responses where previously you would have never expected any. Justin Bieber might retweet your appeal for a lost cat for example, or you might convince Richard Dawkins that God exists. Can I just say that the @RoyalMail is the most inefficient, inept, parsimonious and arrogant company I've ever done business with. Hi Gary, I'm sorry you feel this way, is there anything we can help with? Well, I dunno, let’s see shall we? 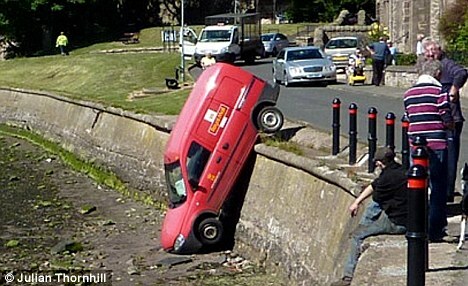 In April this year the Royal Mail confirmed its intention to close their local delivery office at Leigh-on-Sea. This is where mail sent to my PO Box address is stored, and also where my domestic mail is held (thanks to the Royal Mail’s Call and Collect scheme). The reason why I had opted some years ago to collect my mail - rather than have it delivered to my house - was the continual damage to anything larger than a DL sized envelope, which was more often than not folded, crushed and shredded half to pieces passing through my standard-sized letter flap on the final few inches of its sometimes long and arduous journey. I must admit that the Leigh-on-Sea delivery office was a mere five minute stroll away from my home/office/studio, and the ability to collect my domestic and business mail together at the same time, in invariably perfect condition was a bonus. Two weeks ago on the 10th August, the delivery office closed and moved its operations to Southend-on-Sea, a five mile journey on some of the most congested roads in the country. Not wanting to endure a thirty-minute-plus round-trip on a daily basis to collect my post, I made enquiries at the Leigh office on their penultimate day of opening about having both my personal and PO Box mail changed from collection to delivery. They told me to contact Royal Mail ‘Modernisation,’ which upon arriving back in my home studio I duly did. I found the number to call on the Royal Mail’s website and after eventually negotiating the typically convoluted automated voice systems I managed to speak to someone that – after consulting with an unheard superior – gave me an email address where I could authorise the resumption of home delivery for my domestic mail. She then patched me through to their business department from where I eventually gleaned another precious email address, this time for my business mail. I fired off two very similar emails to two different email addresses, and to be fair, I received swift responses, both promising that the appropriate departments would be correctly informed of my change of circumstance. First thing yesterday morning - after nigh-on two weeks of no mail deliveries at all - I attempted to find the phone number for the Southend office but gave up after ten minutes Googling. Obviously the Southend sorting office prefers not to be distracted by people phoning up and asking where their mail is. So instead I sent off another two near-identical emails to Royal Mail, and early yesterday afternoon I discovered a huge stack of mail that had been pushed through my letterbox (slightly crushed and only mildly shredded), each piece heavily marked ‘C&C’ in biro. It didn’t take long for my superior intellect to figure out that this was an acronym for ‘Call and Collect’ and therefore, as suspected, all of my mail had been collecting dust in a pigeon hole in Southend. Amongst the various bills, statements and the odd magazine I discovered two pieces from the Royal Mail themselves; one a short letter stating that my request to change from PO Box Collect to PO Box Delivery had been noted, and the other an invoice for £59.40, being the balance between the cost of the two services for a period of twelve months. Now the first thing that stuck me was the fact that in their wisdom, the PO Box team had sent letters about the delivery of my mail to a pigeon hole in Southend, to which I could not respond as they hadn't been delivered to me, rather than simply continuing our email correspondence. The second thing that struck me was that, after double checking the invoice, I realised that the delivery charge had been backdated to when I renewed my PO Box account in March. Effectively, I was being billed for the Royal Mail to deliver the PO Box mail that I have already collected from them over the past five months. Assuming that this was some sort of clerical error I called the number on the letter for ‘any queries.’ After breaking the keypad code to get through to speak to a real live human, I was informed that this indeed was the case, and there was no option for me but to either pay the invoice and have my deliveries resumed, or to collect the mail from Southend myself. The telephone operator kindly offered to pass my request for a partial refund on to a higher authority, but he already knew what they would say. It wasn't his fault of course; he being just cannon fodder to act as insulation between the Royal Mail hierarchy and their customers, so that they can continue making unreasonable and inflexible policies without having to face any consequences. So, not only have the Royal Mail closed my local delivery office – the one I expected to be able to continue collecting my mail from when I renewed my PO Box account – not only do they expect me to choose between spending over half an hour every day driving into Southend and back, or to pay for the privilege of having my PO Box mail delivered – but they also expect me to pay for a five month period where I had been collecting my PO Box mail myself. Rather amusingly, I also discovered a ‘We Tried to Deliver…’ card in amongst my pile of mail, despite the fact that - you guessed it - I was at home all the time. I would have thought that it would be in the postman’s best interests to actually deliver a bulky package, spend a few seconds looking around for something that looked like a doorbell or an intercom buzzer, rap on the window maybe, perhaps see if a neighbour would take it in… rather than have to write out another ‘We Tried to Deliver…’ card and take the package all the way back to Southend. But, no. And now, I have to wait until Tuesday to have a redelivery attempted at the earliest. The saddest part of all this is that none of it surprises me. It’s all entirely typical of my experience of the Royal Mail’s behaviour and general level of service over the course of the last twenty years or so. The worst part is that not only has the service gradually deteriorated over time, the quality of service reduced to such a point that I'm actually surprised when a first class letter arrives the next day; their deliveries have been cut from two per day to one; delivery offices are being closed all over the UK; and, worst of all, that their charges have increased exponentially over the corresponding period. Newspaper journalists always enjoy when the price of a first class stamp is raised as it makes good headlines. Last year the cost of a first class letter went up 30% to 60p, and a second class stamp went up 39%. In 1993 the cost of a first class stamp was 27p. International costs have soared by an even greater degree, and it has seriously curtailed and quite possibly put a stop to my tradition of mailing out specially drawn Strangehaven Christmas cards to friends, colleagues and customers. But other changes to the service have made nonsense of postage costs for small businesses like mine. If you've ordered a set of three Strangehaven trade paperbacks since the Royal Mail brought in their domestic ‘large letter’, ‘small parcel’ and ‘large parcel’ services (based on dimensions as well as weight) you may have wondered why they arrive in three separate packages. The answer is that it costs almost twice as much to send them in a single parcel. That is illogical, stupid and just plainly unfair in my opinion. I now use services like Collect+ http://www.collectplus.co.uk to send my packages, which are cheaper, more convenient, reliable and trackable. Most outrageously of all is that the cost of my PO Box Collect service for a twelve month period has risen from £62.85 to £244.20 in the last five years. That’s a quadruple increase! In five years! That is just so far beyond any relationship to rising costs or inflation it’s ridiculous. How they can justify that price for what is essentially the hire of a portion of a wooden box and a divider is almost beyond comprehension. It’s simple extortion to charge this amount to small businesses that have promoted their company over a period of years and invested in business cards and stationery with their PO Box address printed on it. Personally, I am currently assessing alternative mail delivery options, as there are numerous and more affordable alternatives. It sometimes looks to me like the Royal Mail is almost deliberately pricing itself out of certain services they no longer wish to provide. It certainly seems like an attempt to become a relatively viable business to be open to privatisation in the not-too-distant-future, as has been surmised for years. How about compensating the residents of Leigh-on-Sea for closing our local delivery office without any consultation? A bunch of flowers, or a box of chocolates perhaps? How about waiving the delivery charge for all Leigh-on-Sea PO Boxes until the renewal date of their PO Box account? We didn't ask – actually, we didn't want you to close it, after all. That would be only fair. Or, how about not invoicing me for five months of a service that you haven’t actually provided me with?